If you read the HBR Blog post that I co-authored with Marco Bertini (11/18/13), the sections below will suggest some links for more information on FairPay. 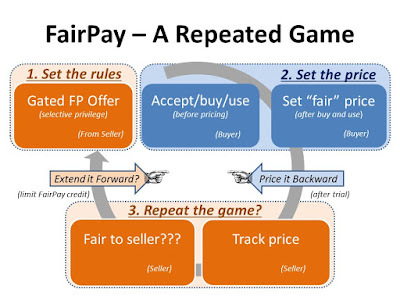 If you have not read that Harvard Business Review Blog post, it offers a summary of some of the ideas behind FairPay, and how they fit into a flexible architecture for better pricing that moves the exchange between seller and buyer from the transactional to the relational. We hope you will comment on that HBR post, and let us know what you think. Marco and I are collaborating on a longer article that explores the principles of this architecture more fully [preliminary version]. Marco is Assistant Professor of Marketing at London Business School, a prolific author in HBR and other leading business and academic journals, and has been working for some time on many of the strategies that FairPay builds on. (More background on Marco and his work.) My background is as a practitioner in online media and e-commerce, and the technologies that drive that. Our collaboration has been very rewarding, and we are very pleased that this HBR Blog post will bring these ideas to more people. --Details on the FairPay Web site. FairPay for The Times?...for JournalismOnline newspapers?...or Google Newspass? 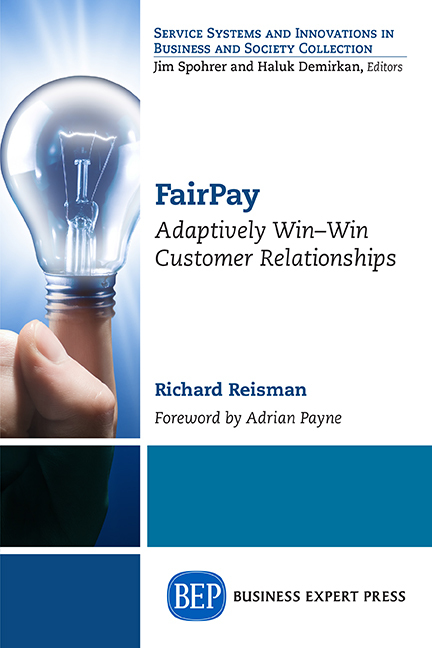 I offer free consultation to those interested in evaluating and applying FairPay, and am happy to address questions. Please contact me at fairpay [at] teleshuttle [dot] com. *The fuller article co-authored with Marco Bertini has been submitted to a leading management review, and a working version is online. As a follow up to my post on Jeff Bezos and The Washington Post, I turn to another exciting entry into journalism by a top-tier e-commerce innovator with very deep pockets, and how the new FairPay business model can work for that adventure as well. Pierre Omidyar, billionaire founder of eBay, also considered buying The Washington Post, but revealed in his blog that he decided instead to actively participate in developing an entirely new media platform intended to support and empower independent journalists. Such a platform is especially well suited to the use of the FairPay architecture, with its ability to engage readers to partner with journalists, by serving as patrons for work that they value. My earlier post on Bezos and The Post outlines the fundamentals of how FairPay addresses this business challenge. This post builds on that. Technologists understand our users and break down how user engagement increases from somebody that maybe just tries your product once and then goes away, to a different kind of person that progressively gets more and more engaged and then becomes just totally locked into your product. That’s something people in Silicon Valley spend a ton of time analyzing, working on and thinking about. FairPay integrates this kind of engagement directly into the value exchange process (as described in my Bezos post). Here I highlight additional aspects of Omidyar's focus on "elevating and supporting" individual journalists, and how FairPay supports that. Omidyar says (to Jay Rosen) he wants to run his venture as "a company, not a charity." That means generating a revenue stream (presumably from readers, not advertisers). Rosen describes this as "the personal franchise model." The ability to engage readers to serve as patrons is essential to that. FairPay naturally integrates the reader's evaluation of a journalist's value directly into the pricing process. It engages the reader in ongoing "dialogs about value" on how the reader values the work of each journalist over the course of their relationship. Readers intuitively recognize many dimensions of value, and the dialog can easily be structured to elicit pricing that factors in this judgment with regard to such dimensions as quality, style, investigation, reader value, and social value . With FairPay, an Omidyar media platform can get direct feedback from each reader on the perceived value of each article, the body of work by that journalist, and the media service as a whole. This can be directly linked to compensation for each journalist, thus increasing engagement and the quality of the relationship on both sides. Readers will know that a significant portion of their payments go to the journalists, and that their feedback bears directly on how journalists are paid (and what investigations are funded). Conversely, journalists will be motivated to create a body of work that readers recognize as valuable by voting for them with their wallets. This gets to the issue of "Creating Shared Value," as described in the influential 2011 HBR article by Porter and Kramer, which suggests the need to "reinvent capitalism" with broader ideas about value creation that will "unleash a wave of innovation and growth." They propose that "creating shared value represents a broader conception of Adam Smith's invisible hand." 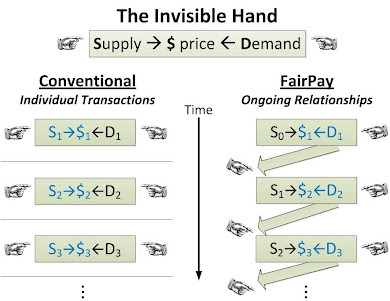 Another of my earlier posts shows how FairPay operationalizes that idea to reflect judgments of shared social value directly into pricing dialogs, creating that broader conception of the invisible hand. FairPay is uniquely focused on creating the multidimensional dialogs on value that are needed to turn readers into patrons of important journalism. It not only supports the journalistic effort, but guides it to the tasks that the reader/patrons consider important. It builds a deep relationship with readers that can feed directly into the key editorial processes that determine which journalists to support, in what investigations, and how they are paid. It builds a value discovery engine into the heart of the media platform, to drive it toward work that is good and important, and to get readers engaged as patrons who pay for that, both for themselves and for the common good. And given a model in which (as Rosen reports) "all proceeds...will be reinvested in journalism," readers can be strongly motivated to be generous patrons. Omidyar is quoted as saying he started eBay on the premise that "people are basically good." Modern behavioral economics demonstrates that his faith is well founded. FairPay offers a way to apply that virtue to support a wide range of valued services, including support of quality journalism. In doing that, it leads to the answer to Jeff Bezos's central question: "Why should I pay you" (see previous post).